KULINARYA Puto ~ I Can Do That! I have never heard this version. That is a nice way to make it without coconut milk. 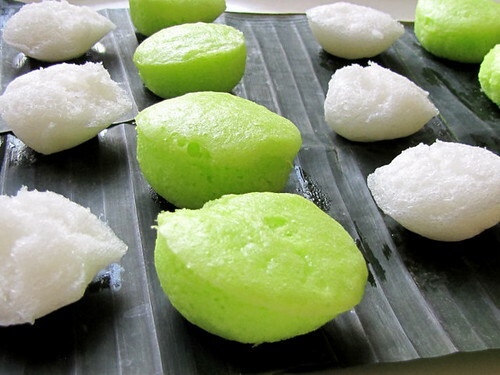 I love the bright green of your puto pandan - so spring-like and happy! what kind of rice? is it rice flour or regular rice? Do you have to drain the rice before draining? A, if you want to. I just use a slotted spoon. Thanks (: I meant "do you have to drain the rice before blending" sorry! Hahah thanks for this recipe! Do you have to wait for 5 hrs to soak the rice if you are using rice flour? No need to soak, just mix with water but I can't give the exact measurements. Here is another recipe but you have to make adjustments as this one has coconut milk. Hope that helps. I wasn't too happy with using plastic wrap but if you want to try, Saran would be the best. I have been steaming for more the 15 minutes & it's sticky on top...what did I do wrong? ?